“The secret of Happiness is Freedom, and the secret of Freedom, Courage.” - Thucydides (460 BC – 395 BC), Greek Historian. Nikos Douroudakis and Stavros Katsoulakis from Queens, New York, immigrants from Sfakia, Crete, related incredible stories of heroism and perseverance in peace and war. Crete has untold stories of heroism rarely discussed. 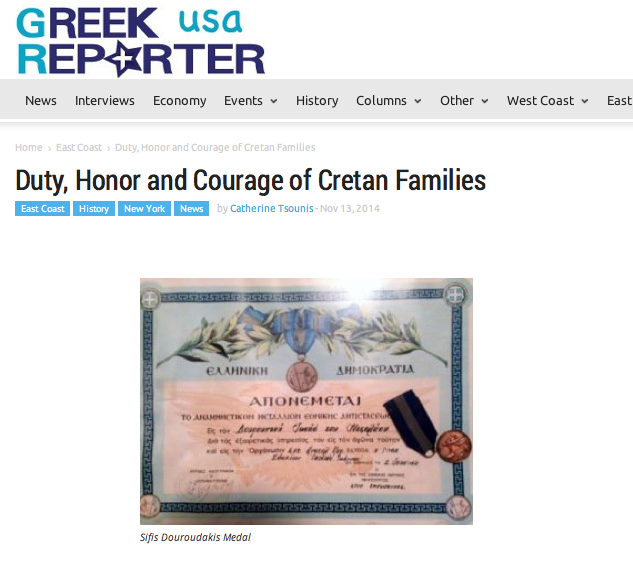 Nikos’ brother, George Douroudakis, described the unique history of their father in an internet interview from Athens, Greece. “Sifis Douroudakis or Douroundous (or Ndoutoundous, Katsoulos, curly-haired, or Katsoulosifis) was born in 1897 in Sfakia, Crete. These were the Black Years of Greece’s participation in the Greco-Turkish War.” According to Wikipedia, “The Greco-Turkish War of 1897, also called the Thirty Days’ War and known in Greece as the Black ’97 or the Unfortunate War… Its immediate cause was the question over the status of the Ottoman province of Crete whose Greek majority long desired union with Greece. Despite a decisive Ottoman military victory, as a result of the intervention of the Great Powers, after the war, an autonomous Cretan State under Ottoman suzerainty was established the following year, with Prince George as its first High Commissioner. This was the first war effort in which the military and political personnel of Greece were put to test after the Greek War of Independence in 1821,” . . . .